Am I able to use fresh spinach instead of frozen? I made this today and was dissapointed that it didn’t have a lot of flavor. I’m going to put marinara sauce over it and hope it will taste better. Made it for Easter dinner since my husband is unable to eat tomato sauce. I bought pre-cubed butternut squash and microwaved it in the bag. Added chicken broth to thin the puree. We both loved it, and he’s not a veggie eater! Even better reheated the next day for lunch. Great recipe. You will want to double or triple this recipe so that you can have it for days and days. I’ll be honest…I didn’t have high hopes for this recipe. I mean… butternut squash sauce?? seriously?? I like it better than Original Lasagna with fatty sausage! My kids (I have 4 teenagers) and husband LOVE this meal. I have made it several times now and will NEVER tire of it. I might try to add chicken sausage to it if we start to tire of it, but I doubt that will ever happen. try it wuth extra sharp cheddar in place of italian blend. its so good!!! I made this for dinner tonight, and it was delicious! 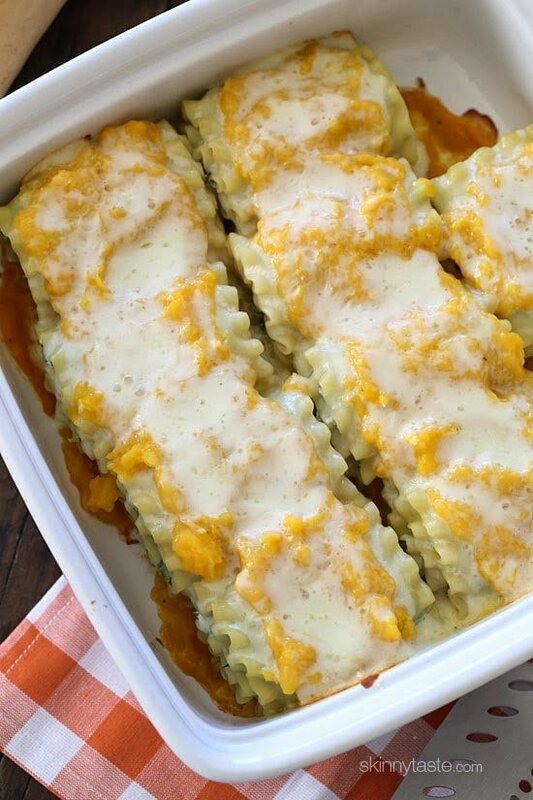 I ended up roasting the squash and using whole wheat lasagna noodles. It definitely tastes indulgent! 20 month old and 5 year old cleared their plates and husband said it was the best squash dish I have served! Thank you! Wonderful recipe! I never post comments, but I just had to thank you….I am new to Weight Watchers and, while searching for inspiration, found your website. I just love it — The delicious recipes, the layout, the meal plans…. 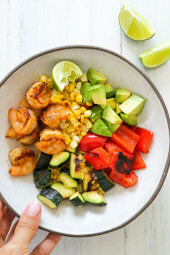 You make healthy eating enjoyable… and suddenly, cooking, planning meals for the week and embracing a new life style doesn’t seem so daunting.Thank you for all of your hard work and sharing your talent! Gina thank you so much for sharing all your recipes.Everyone recipe I have made has been excellent,even my picky husband says they are great.It makes following weight watchers so much easier with all your great recipes.Thank you sooo much for taking your time and effort to do this,it is truly appreciated more than you could ever know. A lot of work but absolutely worth the sweat! So delicious and perfect if you are a meal prepper for the week like I am! Awesome, Awesome, Awesome…..my 92 year old father loved it as well my family…..Gret Recipe. I made this earlier this week and the only substitution was to use extra old (extra sharp you may call it) regular cheddar in place of the part skim cheese. It added a few points (7sp per roll) but it was soooo good, the tangy taste really worked well against the sweet squash. Will definitely make again! I’m eating it as we speak and I love it. I used frozen pureed winter squash and did not thin it. I will try that next time as well as baking it a few minutes longer. I made this tonight and it was absolutely disgusting. I’m so disappointed.. supper is ruined. I made it also and it is so delish! I just wish the serving size was bigger! Lol a little dramatic don’t you think? Delicious! I bought peeled and cut squash to save time. Thanks for the yummy recipe. I have made this recipe numerous times since I found it two years ago. 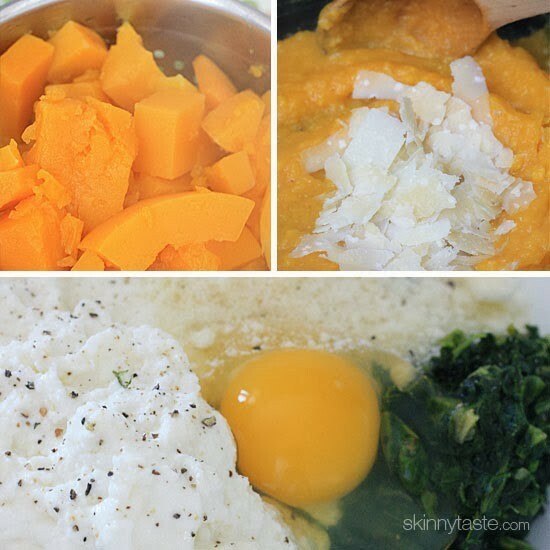 I love love love this dish as is, no alterations..
Can you use frozen pureed squash? I liked this in theory but mine turned out a bit dry – nor was it cheesy like in the photograph. I think next time I will thin the sauce a bit, and add more cheese. I didn’t read the instructions thoroughly and didn’t “frost” the noodles with the spinach mixture; I just blobbed it on one end and rolled up the noodle. Oops! That may have made a difference. Potential! 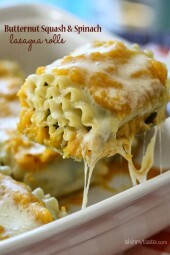 I will definitely try it again: pasta, squash and cheese — what’s not to love? This has become a new favorite at our house! All though I love everything I’ve tried that you posted I don’t normally comment but I have to say I absolutely loved this recipe and so did my daughter. I will be making these again. Thank you. Thank You Gina for another great recipe. Is there anyway to make this in advance? Could I prep the butternut squash sauce on day before – or even prep the whole roll ups the day before? Made this last night, first Skinnytaste recipe ever. 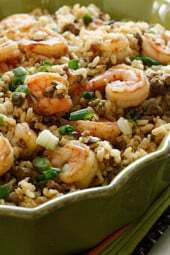 I recently joined Weight Watchers and have seen people posting a lot of ST recipes. I followed this recipes exactly with 2 exceptions- I made this like a traditional lasagna (layered) and added ground turkey (my dad is recovering from surgery and he needed the protein). All 4 of us loved it. Even with the turkey addition the other ingredient amounts didn’t need any modifications. Thanks Gina! Made this last night and it was fabulous! Great recipe! Great recipe, I serve with a bit of marinara or diced tomatoes on the side as low fat ricotta can be a bit dry. Can I make this the day before? Thanks! This was my kind of recipe, but I really did not expect my husband to like it. He loved it. Thank you. Would this be okay without the spinach? I’m not a fan of cooked spinach and wondering if I could just leave it out. Do you think ground turkey would be good in this? I made this for dinner tonight. 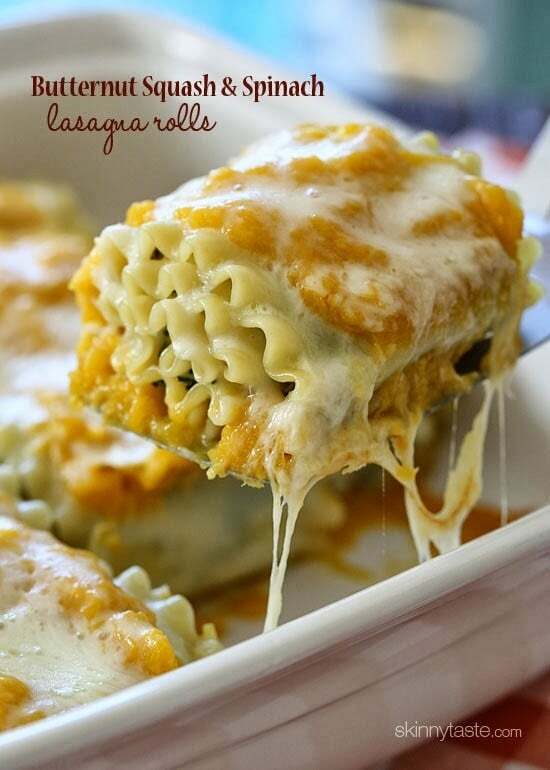 It is so good and one roll up with a slice of warm crusty italian bread really filled me up. Thanks so much for these great recipes! Hi Gina. I was thinking about using can pumpkin purée and adding new some Italian chicken sausgage. How much do you think this will skew the points? Thanks!! I have made at least 20-30 of ginas recipes and this was my favorite BY FAR (the coconut cupcakes were a close second). So delicious.. A bit more time consuming than my usual go-to crock pots dinners but so incredibly Delish. I added shredded chicken to the lasagna and it was so so so good. Will be making this again for sure. Has anyone tried freezing this? The recipe is to much for my husband and I (the kids won’t eat it) it sounds delicious! Just wondering if any had done this and froze it? This is the 2nd time that I have made this recipe & froze it. I usually use 2 small pans because I make meals for my daughter that just had a baby. I always freeze her pan & we eat the other. They say it tastes great after it has been frozen. I forgot to mention that I make this as lasagna & not rolls. Hi Kathy… Since you have frozen this recipe before… Do you have any tips for reheating? I will freeze it in roll form because I find it easy to serve. I don’t think it should make a difference. I am trying to make tonnes ahead of time to freeze so I have meals ready once baby arrives. Anyone tried to freeze this? I love to double my lasagna recipes to have a second in the freezer. Wondering if this recipe would freeze and reheat well? I would like to make this today and freeze it, I’ve been searching trying to find someone that did freeze it and at what point and how it was. How did it work for you? I wonder what would happen if I used canned pumpkin instead of butternut?? HI Am always worried with extra calories intake especially when we don't have the light version of Ricotta cheese in our country?? what would be an alternative for Ricotta cheese?? Made this tonight and my 12 year old picky eater loved it as did my husband and I. This will be part of a regular rotation in this house. I think a little nutmeg might be nice. I used a combination of whole wheat and regular lasagna and fresh spinach instead of frozen. I also used more cheese on top. I am about to make this recipe for the third time. The only change I make is that I use whole wheat lasagna noodles. It is absolutely DELICIOUS! I live in aurora, ontario. Anyone Know of a really good quality GF lasagna noodle I can use. Gina keep sending your awesome recipes.. !!!! I made this for the second time tonight and usually after one time, I can cut down the time it takes for me to prepare a recipe, but no, I can't seem to spend less than 2 hours on this one. My husband commented that the kitchen looked like after Thanksgiving. I think I used every bowl and pot in the house. That said, worth it. So yummy. I just made this recipe and it's fantastic! 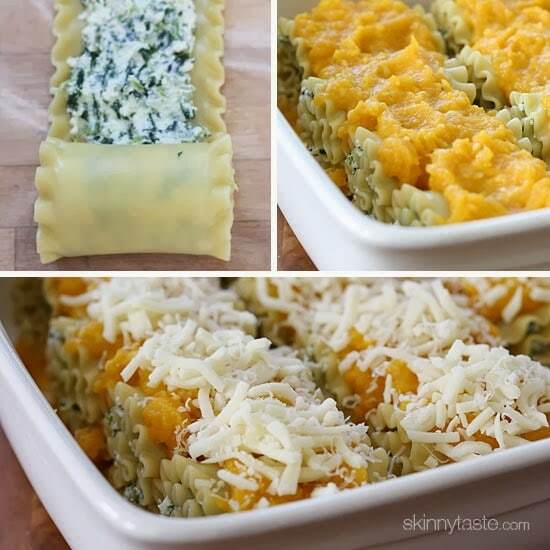 I've never paired squash with pasta and cheese before and this exceeded my expectations! It yields nine servings, so after I cooked it to completion I divided the portions up into small containers, perfect for lunch on the go or dinner rush. Each lasagna is somewhat small but satisfying, so I suggest roasting green beans, broccoli or asparagus to pair with it, if you have a bigger appetite that day. I made this tonight. Wonderful and very filling when paired with a salad. Even my hubby and 2 of my kids ate it. More butternut squash recipes! Just made this, and WOW! So good! Love your recipes Gina! I would like to make this, but for 2 of us it's a lot. Has anyone frozen it for a future meal? Since it seems to take a while to make it would be a wonderful recipe to make once and serve twice!! If so, at what point in the preparation process would you freeze it? Thanks!! I made this for dinner a couple weeks ago and LOVED it. My boyfriend has been begging me to make it again; it's a little time-intensive for my schedule (cooking is not exactly my forte, so it takes me a while to make anything! ), but totally worth it… and hard to not eat all the rolls at once! I was impressed, my boyfriend was impressed, and when he brought the leftovers to work the next day, his coworkers were impressed (with the smell — I didn't let him take the whole thing and he had no intent of sharing it). This is definitely going to be a regular on our winter menu! I haven't read through all the comments because I'm in the middle of making this recipe now from the cookbook. Just want to point out the 1/2 cup of Parmesan cheese for the cheese mixture in the rolls is missing from the cookbook ingredients. Made this for dinner tonight, trying to make some healthier meals. Husband is super picky but has been willing to try new recipes lately. We have made 5 other recipes from Skinny Taste and they were all delicious. This one was a flop with my family but I didn't think it was that bad. They are just used to regular lasagna. My husband said the sauce looked like baby food. The Mongolian beef and broccoli recipe is amazing though. This recipe is so good. My little boys love it. They ask for it all the time. I used dried food to make this and it tasted amazing. If you want to try it with dehydrated food then visit where I got my dehydrated food. Thanks. Just bought your cookbook and compared the cookbook recipe for this dish to this one on your website. The cookbook does not have the 1/2 cup parmesan in the list of ingredients. So glad I looked at your website! You are right. There is an error in the cookbook. Someone should post corrections!!!! 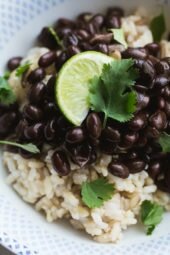 I just found your site about 10 days ago, and I've already made at least 3 meals from it, and based on those successes, I've already picked up your cookbook! We made this last night, and I was blown away by how good it was. I've never been a huge fan of any kind of squash, but I thought it was worth a try. And OMG am I so glad I tried it!! Perfect Sunday night dinner, and it gave us lots of leftovers for busy nights in the following week. The only changes I made were using part skim ricotta (as that's all the grocery store had), and adding a bit of light cream to the butternut squash sauce. Even my Hubby (who really doesn't like WW-friendly recipes thanks to his mom being on WW when he was young) loved it and couldn't stop raving. So great, looking forward to leftovers tonight! Does the egg serve a purpose in the spinach/cheese mix? I've never used one in my fillings and was wondering what it is for?? Love this site and up until now I haven't found anything I don't like. However, I made this lastnight and was very disappointed. It didn't have any taste at all to me, maye I left something out or something went wrong. Will still be trying new things on here though. I made this several months ago. I sort of liked it but would probably have enjoyed it more had I not OD'd on the squash. The squash was big (about 3#) and I used all the mixture instead of saving for another day and it was just too much! I did freeze leftovers and I know I need to eat it but because of the mistake I made I can't bring myself to. 🙁 Lesson learned. I just made this and it's delicious! Used whole wheat noodles which seemed to really compliment the squash! Thanks! Just made this tonight, and it was soooo good! The flavors went so well together. Do you think premaking the sauce and freezing it would be ok? I've made this several times and love it. Just wanted to share my changes in case other people are looking to mix it up a little – I replaced the ricotta with a mixture of firm tofu, cottage cheese, lemon juice, parsley, basil and garlic salt. I was looking for ways to get more into tofu and this dish made it happen! I love your site! There hasn't been one recipe I've made that I haven't enjoyed. Could I make this with frozen butternut squash? Thank you! I was inspired by this to make a regular layered lasagna with homemade spinach whole wheat noodles (plus I added chicken!). Delish! Gina, I just popped this in the oven for the first time. We'll be taste testing soon. But when I got down to my last two lasagna noodles, I had to do half of 1/3 C. of the cheese and spinach filling because I ran out! I used 15 oz of ricotta, 10 oz of spinach, a large egg, 1/2 C. parm cheese and salt and pepper. I used a 1/3 measuring cup to carefully measure out the filling for each noodle and I was still short…. Should I have used scant 1/3 cup? Can you make this a day ahead, so it is ready to pop in the oven when you get home from work? Did you have a similar recipe with tofu and marinara? I swore I had gotten it off of this site but now I am not so sure! I made this recipe last night for dinner and it was delicious! I accidently added the Italian shredded cheese to the ricotta/egg/parmesan mixture, but I just added extra on top and it still turned out great! Thank you for the wonderful recipe, I can't wait to try more! Delicious! I feel like I can always count on your recipes to be a success. I did modify the recipe, based on some of the comments. I increased the sauce. I am interested in reducing the amount of dairy I eat, so I swapped out the ricotta for firm tofu (pressed to extract some of the water) – side benefit…it's half the calories and fat of ricotta. I added some fresh sage to the shallot/garlic saute. I also par-boiled the noodles in the same water that I cooked the squash in to avoid dirtying another pot (I had to add a bit of fresh water to come up to the appropriate level, and it worked fine). Another "keeper" recipe. Thank you! Great idea to cook the pasta in the same water used to boil the squash!! I will do that next time I make this dish. Thanks for the tofu idea. My hubby is cutting down on dairy. I will try it! I made this last month and we loved it! Thanks. In fact we loved it so much that I'm planning on serving this for dinner over the holidays to guests. Any suggestions what to accompany it with?? We're trying to stay away from bread. Think this would work in the slow cooker??? Hi, I made this w regular noodles and it came out great… but now i am making it w/ De Boles gluten free rice lasgna… which you can't roll. The box says to cook for an hour, but skinny taste says 40 min. we shall see.. woo hoo! I plan on making it tonight, but not rolling the noodles. It is for work and I think if I lay it out like a regular lasagna I will get more out of it, Your thoughts please. Should I just stay with rolling them or is it no different? Comments please. Did it work like a regular lasagna? We tried that the last time we made it, and it wasn’t as good. The consistency was different. Well, after reading the reviews I wonder if I did something wrong! To me this was ok, but very bland. I added a lot of salt and pepper but it needed a whole lot more. I think I would try it again, but add some sage to the sauce, or possible some fresh grated nutmeg. I would also add a little sugar to the ricotta mixture. Oh, and instead of spinach I will use kale, it tastes so much better than spinach in something like this. It was a good start, but I will make some changes next time. This is in the oven now. I made a few changes: I used whole wheat pasta that needs to be boiled and I only used white pepper. I added some nutmeg and basil to the ricotta mixture. While the onion and garlic were cooking, I added in about 14 cup of white and let it cook down then I added in the squash with a bit more white pepper. I used and ice cream scoop to add the ricotta to the lasagna. I had some left over so next time I will be using 10 lasagna. This was delicious!!! I will be making this a lot. – It was so good, thank you so much! This was sooooo good! The only thing I did different was use 1.25 pounds of the squash because I like stuff extra saucy! Thanks for another great recipe! So many others have already said it, but SO good. 2 veggies in one dish = happy gal. I followed the recipe fairly closely, but did not have shallots, so i used 1/4 of an onion, also happened to have part skim ricotta, but I'm sure it would be equally delish with the fat free ricotta, i added some sage to the sauce and tarragon to the filling bc i think those herbs particularly compliment butternut squash. great idea and recipe and results 🙂 I can also proudly say mine look like the picture! I came across this recipe on FB. My son has food allergies and tomatoes is one of the worst he has. The whole family absolutely loved it! I've made it once more and changed it up a bit. Thanks for this great dish! I made this last weekend! roasted the squash instead of boiling it and used a little chicken broth to thin out the sauce. It was even better the next day for leftovers! Made this a couple weeks ago and making it again tonight. AWESOME recipe! Thanks, Gina! Made this tonight as a lasagna (using Ronzoni high fiber noodles)and my daughters found it a little too sweet. Added one of our favorite secret ingredients–feta cheese–and that was what it needed. My younger ate 3 helpings.Will definitely try this again and will add that to the spinach ricotta. Plus a lot more onion! About how long does the squash take to boil? In her cookbook which also has this recipe, she says to boil the squash for 12-14 minutes.